It is the silly season after all. Since 2000, Machine Head (which is on my mind as I am working hard to wrap up the new book!) has been reissued on vinyl by Rhino, EMI, Back to Black, Universal and Warners, in a choice of clear, black or purple vinyl. And those are just the ones I know about. So please forgive me if I can’t get too excited by this and the accompanying set of similarly coloured vinyl reissues of that part of the Deep Purple catalogue which Universal now control. And I own 25 copies of Machine Head, so must be their target market! What saner heads must think I can only guess. Anyhow, if you missed them before, here’s your chance again. Of course they’re remastered, although one suspects this just means a new master has been cut rather than anything more substantial (and I’m not certain remastering technology has developed that much in the three years since the last one!). And sure this work will have been done at Abbey Road, but only because that’s where the tapes are stored and copied. And yes they’re in a nice shade of purple, but then again so was the Machine Head reissue six years ago. It is also limited, not really a big surprise as most reissue vinyl is these days. The sales people calculate the likely market and profit, an appropriate number are pressed, and then the run is closed. It does seem to me major labels are quickly killing off this market; does the world need a reissue on vinyl of the first Now That’s What I Call Music LP? Because there is one. I spotted it in Sainsbury’s last week. Of course the set looks nice in the pack shot (let’s hope the sleeve scanner has remembered to remove the Record & Tape Exchange price stickers this time too! ), but sadly they would just get squeezed onto our shelf, spine out. Maybe my £126 would be better spent on some more shelving. Any variations here? Well they’ve added the Mk 4 label to Last Concert, which also seems to have been pressed in black and purple vinyl (check the inner bag below where someone has forgotten the Photoshop mask)! But you can pick up a nice original import press for only a few dollars more. Or there is a very spiffing original first press minty looking copy of In Rock down at my local second hand shop. At least there is some history behind that. Apparently Steve Morse kicked off some heated online debate following the piece after the interviewer asked : Do you see your career, at some point in the future, going away from Deep Purple and more into the area of Flying Colors? Seems fairly innocuous to me as well as being realistic. They can’t go on hurtling at this rate for ever! It’s actually quite nice to hear they are taking time off to relax and get a bit of writing done. It can only make shows that bit more special if they decide to ease off a bit (Morse has some touring planned for the summer – see next newsletter or check his website). In a sign of the times, the meet and greet at Vancouver was done before the show at 6.30pm so they could get an early night. The set contained exactly one track from the ‘current’ album. It seems a long way from the start of the Rapture tour back at The Astoria in January 2006 (time enough indeed for the planners to have pulled the flipping place down!). It appears that IG tore his Achilles tendon and this explains the on-stage brace he was sporting on the Canadian tour. Sounds very painful. 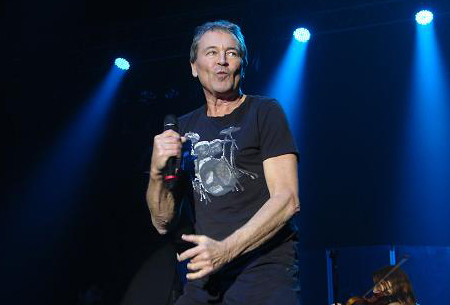 Deep Purple Then • There are rumours of a soundboard of the long lost Lyon show (March 16. 1973) turning up at last. Poor off-air tapes have been about for years and the radio station closed a long time ago, with their archives disappearing (the station has sort of reappeared since but under a new set-up). I can remember trying to listen to the show from Luxembourg on AM transistor in the early hours… the station even had a tie-in music / fashion mag for a time called Fab 208. Total Abandon, the live set recorded in Australia back in 1999, is coming back out again. They’ve taken a tape splicer to the end of the performance to get it onto a single CD for some strange reason, so it’s not complete. It’s also got a new sleeve, the third by my reckoning. Expect it in April. We’ve got it on pre-order at DTB Online Store. There’s a glittery purple vinyl edition of Montreux 2011 due from Night Of The Vinyl Dead in Italy, a triple set in fact. They’re only issuing 500 copies and we can’t get wholesale stock. It’s the same mob who did the Concerto set last year and they sell out very quickly so if you want one move fast. March’s Total Guitar magazine leads with Smoke on the Water and the MK 2 story (sort of). Mainly previously published photos (some Mk3 and Rainbow) but a nice Jorgen Angel shot not published before. Ian Gillan • There is a likelihood of some exclusive high quality Gillan vinyl reissues later this year, and we’ll update you when we know more. They came to us asking if we had any of the original artwork… if only; that Chris Foss cover would look fab on our office wall. I also notice that Ian’s former drummer is doing a few gigs. Under the name of Mick Underwood’s Glory Road, his band cover not just Gillan era tracks but also Quatermass, Peace and others he’s been involved with over the years. Glenn Hughes • has joined the grandly named Rock-N-Roll Allstars “comprised of members from the biggest bands in recent rock history” (not sure what their definition of recent is really, it’s now over thirty years since Glenn was in Deep Purple!). They’ll be touring South and Central America in April/May 2012. Ian Paice • was advertised as taking the hot seat on Planet Rock at the end of February, picking out his favourite songs, talking about the band’s longevity, their plans for the future and the music that has inspired him over the years. Nigel Young had a listen and says it was actually an old interview from December 2008! Cheeky gits. There is however a new interview done in Edmonton which can be heard online. 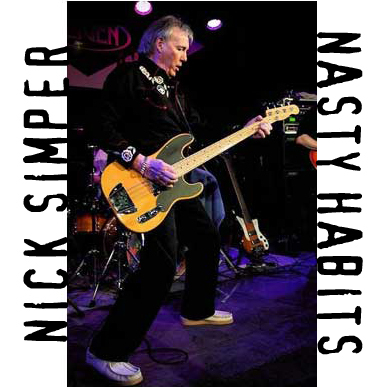 Nick Simper • as trailed last newsletter, Nick joins Nasty Habits on a new set Live at Szene in Vienna, May 8. 2011. This is coming out as a combined DVD plus CD package. The track list covers nearly a dozen Deep Purple classics along with one new track and a blues standard. Release date is imminent, so we’re now taking pre-orders at DTB Online store. Peter from the band says the new track is a trailer for a projected album of new material later this year. Whitesnake • have no touring plans for 2012 according to DC. Perhaps he’s saved up enough for a copy of the Definitive Biography at last so doesn’t need the money?! Talking of which, the competition to win a signed copy on the DTB blog site is running only to the end of the month. Jon Lord • I’ve not wanted to delve to much into Jon’s illness, but Ian Paice has now gone on the record (in that Edmonton interview) to explain that Jon’s cancer was spotted at a very early stage and he has been undergoing some special treatment over in Israel. This is reported to have gone well and there is talk of Jon doing some work in April. In the meantime finishing touches to the Concerto Studio version are taking place. The audio was due on EMI but looks now to be on another label. Ritchie Blackmore • Both the next two reissues in Universal’s ongoing doubling up of the Rainbow catalogue are nearing completion at last. On-Stage is a double, with a disc from Tokyo 1976 as the bonus, most of which is officially unissued before. Long Live has a bonus disc with some early monitor mixes and other material from Cozy’s old archive. Both can be pre-ordered at DTB Online store. On the subject of archives, a CDR boot of Mountain live in Wichita Kansas March 1971 has turned up which includes a (not very interesting according to one fan who has heard it) jam with Richie Blackmore done in a New York studio sometime that year. There’s a group active in trying to get Blackmore inducted into the rock and roll hall of fame by the way, and they’ve just organised the 2nd Annual Ritchie Blackmore Protégé Shred Off competition. Find it on Facebook! But shred off? Surely that’s the last thing Blackmore was into. Tommy Bolin • The Bolin & Friends set has now got a new release date of April in Europe (it was first announced for December last year but held over). It can be pre-ordered at DTB Online store. Perhaps to cash in, one label is repromoting that old Tommy Bolin Snapshot collection again, as the “first ever” European release. Same content as the last time they released it here! We’ve also posted details of a new Japanese Bolin special magazine on the site here. Slightly more tangential but the Airto Moreira ‘fingers’ album (1973) is now out on CD. Why would you be interested? It has the original of San Francisco River on it, the track Tommy played on the TB & Friends gigs in 1974. So if you were curious about the origins, here’s the answer. Thanks this time to : Timothy Campbell, Stuart Hamilton, David Browne, Tim Summers, Nigel Young, Euan Mcleod, Tom Dixon, Danny Fox, Mike Galway, and Harry Heathman. If you have any news for DTB email it over.